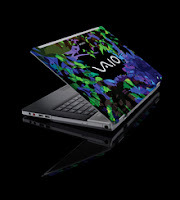 The design of the VAIO FZ Series Graphic Splash "Grow" Edition feels like an organic forest, there is a deep green, blue, and purple flowers that seems to be growing wildly across notebook lid. Hayuk's artwork is not only found outside the notebook but inside as well. The VAIO "Grow" Edition includes a wallpaper that matches the design outside of the notebook and comes with a certificate of authenticity with Hayuk's original signature. The chasis of the VAIO FZ series notebook is encased in durable and super lightweight magnesium alloy, reducing the weight of the laptop but also serves as a durable shell. The VAIO FZ series Graphic Splash "Grow" Edition has a 15.4 inch WXGA LCD screen, 2 GHz Intel Centrino Duo Processor, 2 GB DDR2 memory upgradeable to a maximum of 4 GB, 200 GB hard disk drive, BD-RE/DVD±R DL/DVD±RW/DVD-RAM optical drive, Sony Sound Reality audio enhancer, NVIDIA GeForce 8400M GT GPU Graphics Card, HDMI, VGA and S-Video Out with Smart Display Sensor Interface, Built-in Bluetooth, Intel PRO/Wireless 4965AGN Network Connection, and built-in web camera. The VAIO FZ-series "Grow" Edition has these ports included: Memory Stick Media Slot, Secure Digital Slot, Express Card Slot, Headphone Jack, Microphone Input, 3 USB 2.0 Port, VGA Output, Modem Jack, Ethernet Port, and i.LINK Connection.